This past week I was craving eggs and now this week I am craving refreshing food. I was in need of fruit. I went shopping at Trader Joe’s and I was so inspired by all of the spring food. They had Meyer Lemons, Blood Oranges, and beautiful berries. I knew for dinner I had to make a nice light salad. I believe when you crave food your body is lacking in some form of nutrients. I don’t want to neglect my body, so I ended up making this amazing salad. This is my Chicken & Fruit Salad with Blood Orange Dressing. It is clean eating, all natural and simply amazing. The salad is fresh, sweet and slightly savory. Ohhhhh, the dressing is so good you could just drink it. 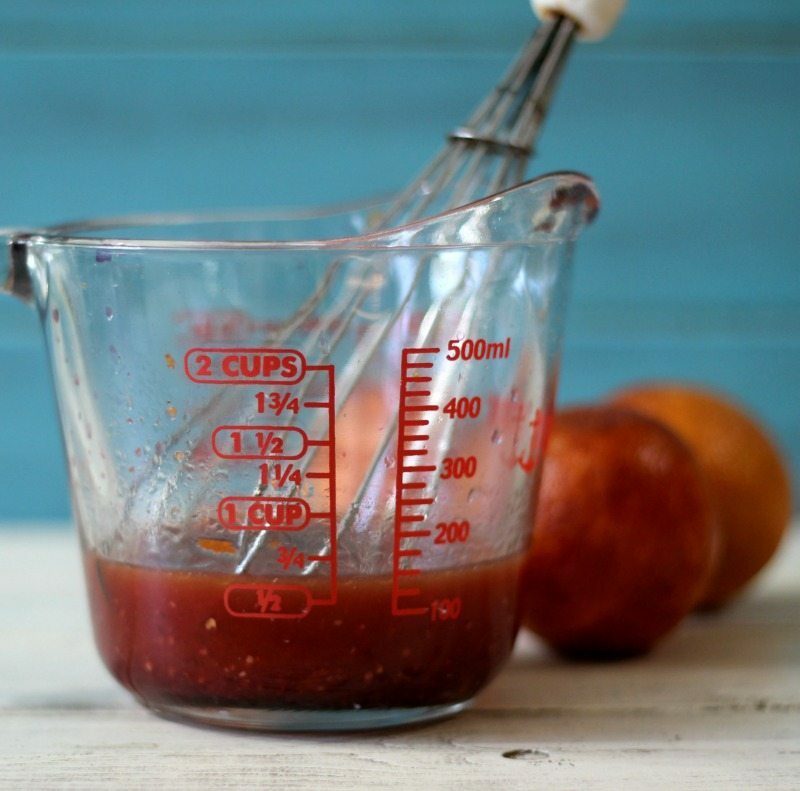 The Blood Orange dressing is sweet with a slight tangy flavor with just a hint of savory. The Blood Orange Dressing is made with simple ingredients, Blood Orange juice, Dijon mustard a pinch of honey, lemon juice and olive oil. So easy and so good. Nothing really beat homemade dressing. The dressing makes about 2/3 cups. We used all of it on our salad. My Husband pour it all over his salad and then asks, “Will I like it?” It’s a little late now that it is all over your salad, but he loved it. That was the first time he ever tasted a Blood Orange. If you never seen one cut, here is a picture you can check out on my Instagram. 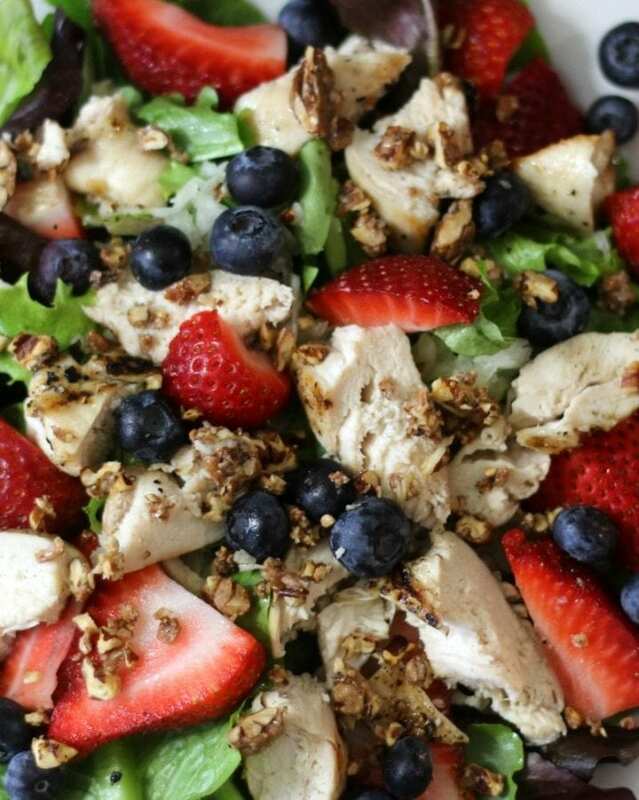 The salad is super easy to make too. 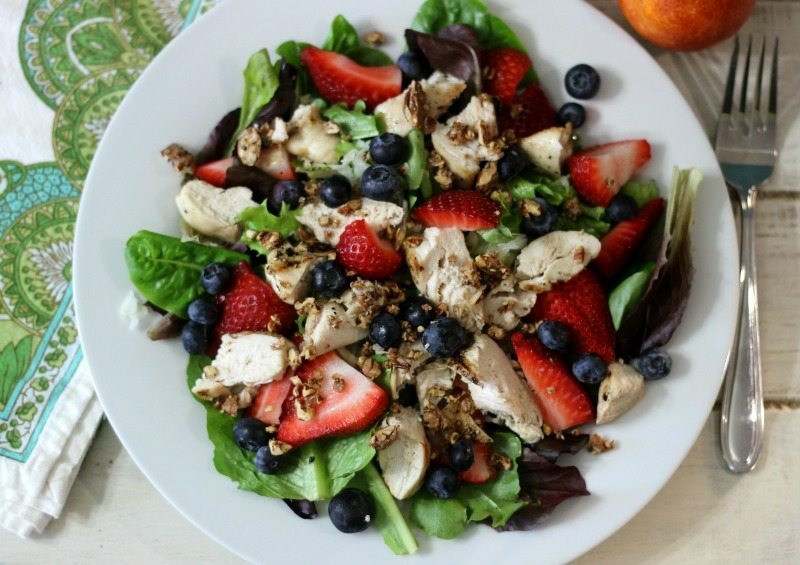 I just added some mixed greens, strawberries, blueberries, fennel and candied almonds. Such a simple combination of flavor and the dressing compliments it all the more. It was pretty warm out today, about low 70’s, so I turned up the grill to cook my chicken. The chicken is flavorful and made with just olive oil, salt & pepper. Easy peasy. 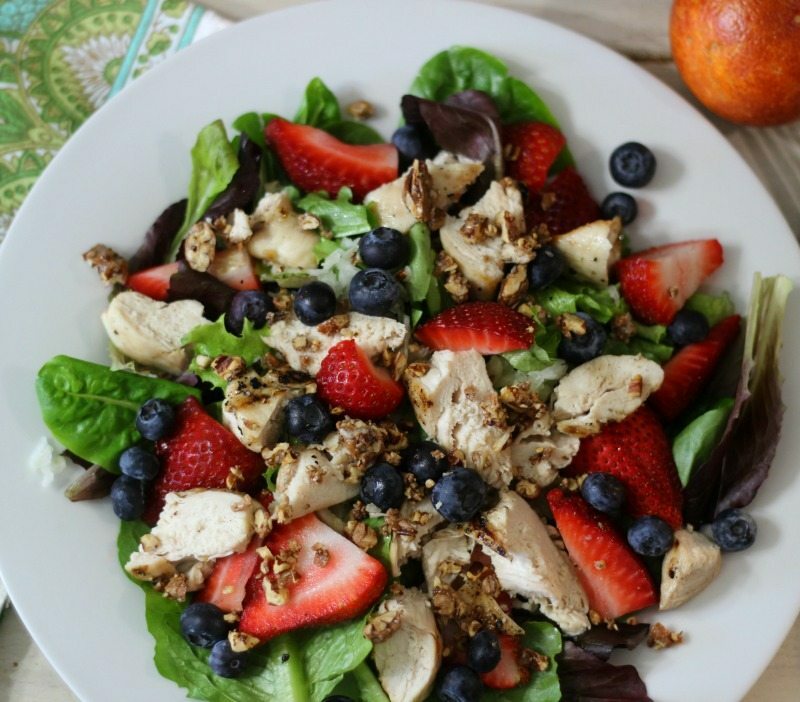 Tender grilled chicken on top of a bed of mixed greens surrounded by strawberries, blueberries, fennel, candied almonds and topped with a sweet blood orange dressing. Rub 1 teaspoon of olive oil over chicken and lightly sprinkle with salt and pepper. Place on grill and cook each side for about 5 minute or until no longer pink. Take chicken off the grill and let cool for a few moments. Then cut into bite size pieces. Meanwhile; divide between 4 plates, mixed greens, fennel, strawberries, and blueberries. 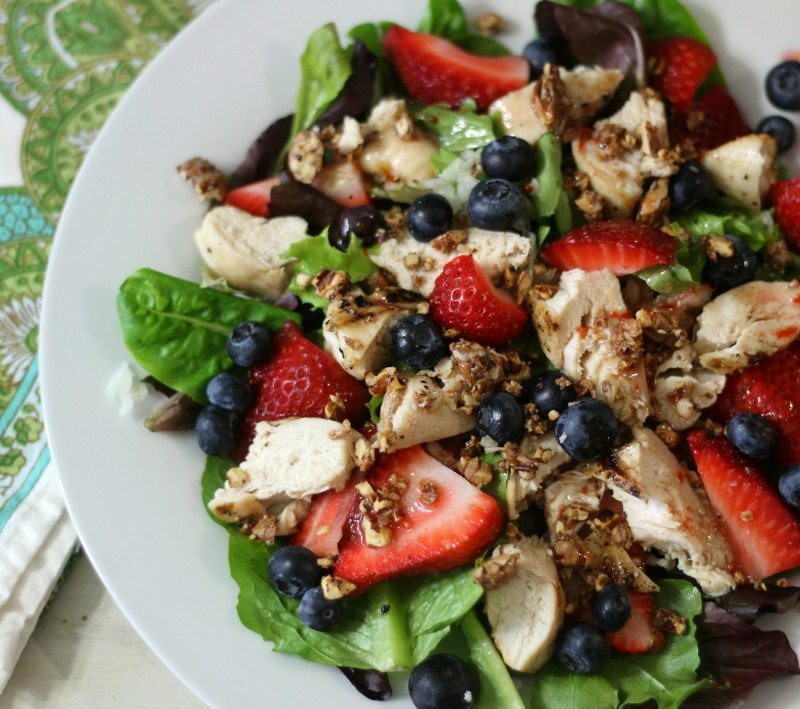 Top salad with chicken and top with candied almonds. In a bowl, add blood orange juice and zest, dijon mustard, honey, lemon juice and olive oil; whisk together until combined. Makes about ⅔ cups. I guess you can say I am having a little kick of Spring Fever! This is my favorite time of year. The trees are budding, the fruit are becoming more plentiful and oh the beautiful Spring flowers are starting to appear. 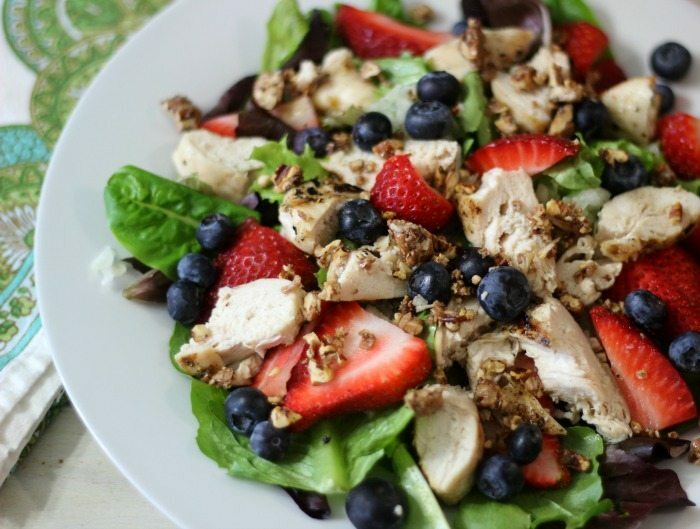 If you’re in the mood for a nice light Spring salad, this is the salad for you. It would also make a wonderful side dish with any meal. I would just skip the chicken. Have a wonderful rest of the weekend. Don’t weekends go so fast?